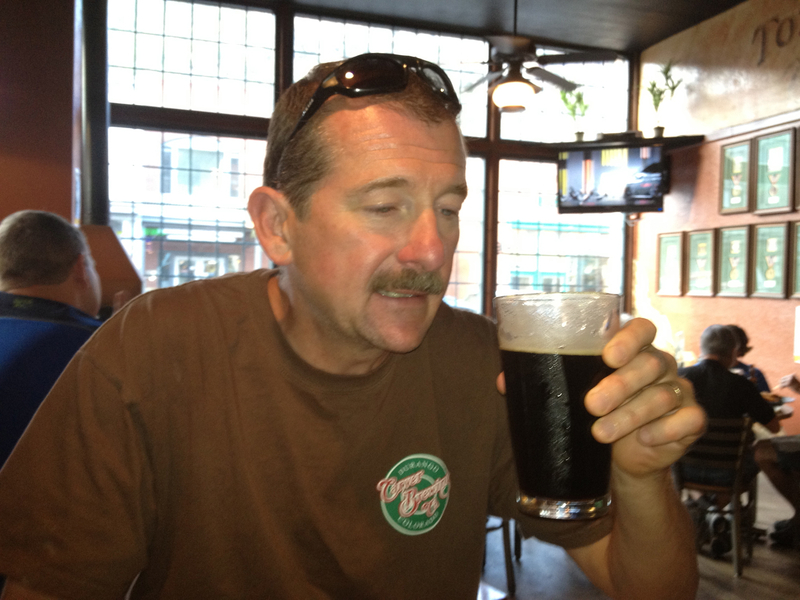 I met up with Rob Friday evening at the Tommyknocker Brewery on Miner Street in Idaho Springs. The place was okay. The town was hopping. Families have started their summer RV excursions to Colorado. A year ago today I was hiking across the Georgia Pass where the Colorado Trail first crosses the Continental Divide. This weekend’s hike is the Chicago Lakes Trail at Mt. Evans. Rob found us a killer camp site off Hwy 103 just south of Idaho Spings and a few miles north of the Chicago Lakes trail head at Echo Lake. We enjoyed the view of a nice meadow from our camp site as we smoked Cohibas that I smuggled back from Mexico a week earlier. I’m not much of a cigar smoker, but these were seriously smooth. Very nice. The temperature dropped quickly as the sun set. Bummer there’s a fire ban but the Cohibas kept us warm. We slept in late by typical standards, not waking up until sometime after 5:30am. 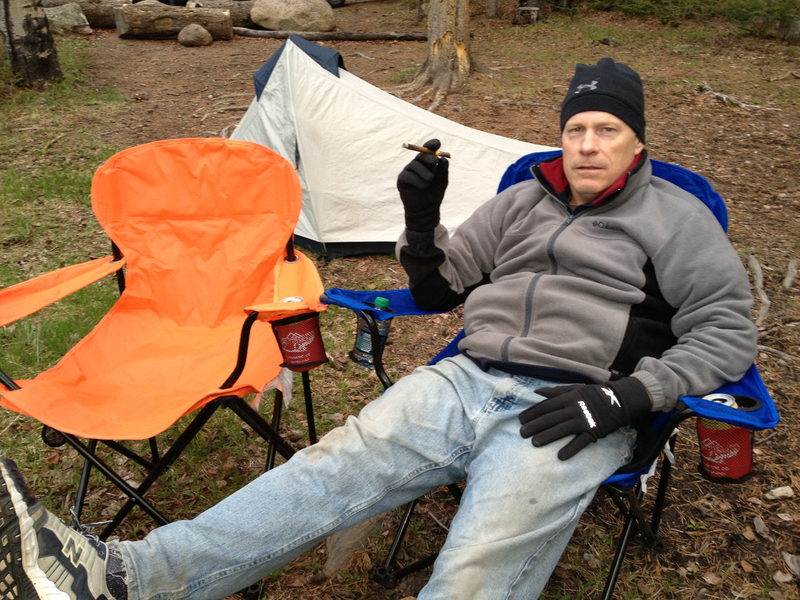 Rob brewed some coffee and then we drove a few miles further down Hwy 103 to the Echo Lake Lodge and trail head. We started off planning to climb Mt. Evans but pulled up a couple of miles short. The hiking was extremely slow going – 2.2 mph overall and 3.3 mph moving – as the trail was buried in places by fallen trees from a recent blow-down. We encountered a pretty Colorado girl returning on the trail shortly after embarking ourselves. She said the blow-down was too difficult to cross. Some of the trees could be scaled but other patches required a bit of bushwhacking to get around. It certainly contributed to a slower pace. The decision to skip Mt. Evans was less due to time however and for me more about avoiding the wind. The weather was decent for this hike with temperatures in the 60s and mostly sunny skies, but the wind and blow-downs presented obstacles. Understand when I say wind, I’m referring to massive chinook gusts that could seemingly pick a hiker up off the trail and carry him down the mountain as it proved it could do with the trees. I imagine this is a popular hike. Discounting the fallen trees, the terrain isn’t too steep and there’s numerous lakes. The slope actually declines for the first two and a half miles and the rise after that isn’t too tough. 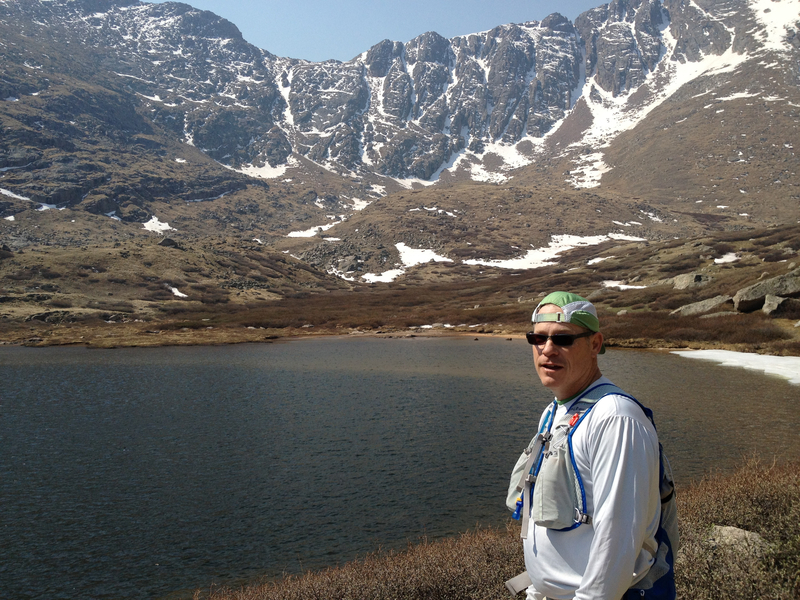 It rises dramatically from where we turned at the 11,800 foot Upper Chicago Lake and the 14,265 foot Mt. 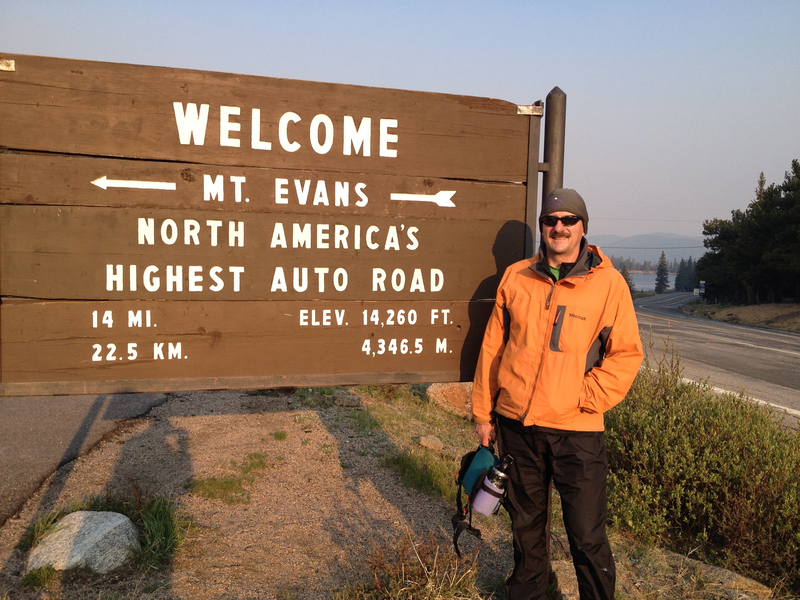 Evans summit. 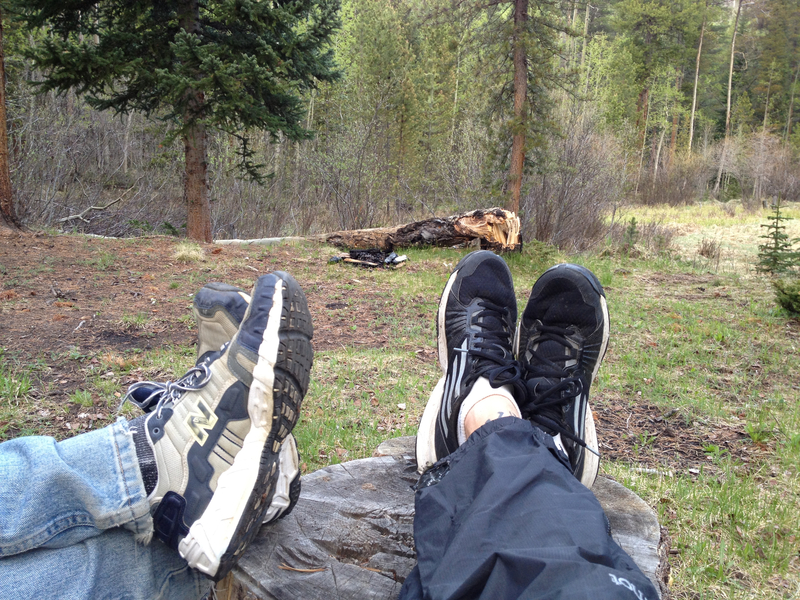 This is also an easy 90 minute drive from Denver, and there are tons of cabins and really nice camping areas. I was of course concerned about my foot injury, not knowing if this stress would cause further strain. I’ve gone three weeks now without any real running. I tried a few miles in Mexico over a week earlier and that hurt, but my foot felt stronger this week. I wore my pair of Salomon trail running shoes, thinking the tread would be stiffer than my other options. Turned out to be a good call because we had to traverse a few decent sized snow packs and these shoes have good traction. They are also water-proof. The next day my foot was a bit stiff but not that sore and I can feel it’s improved. 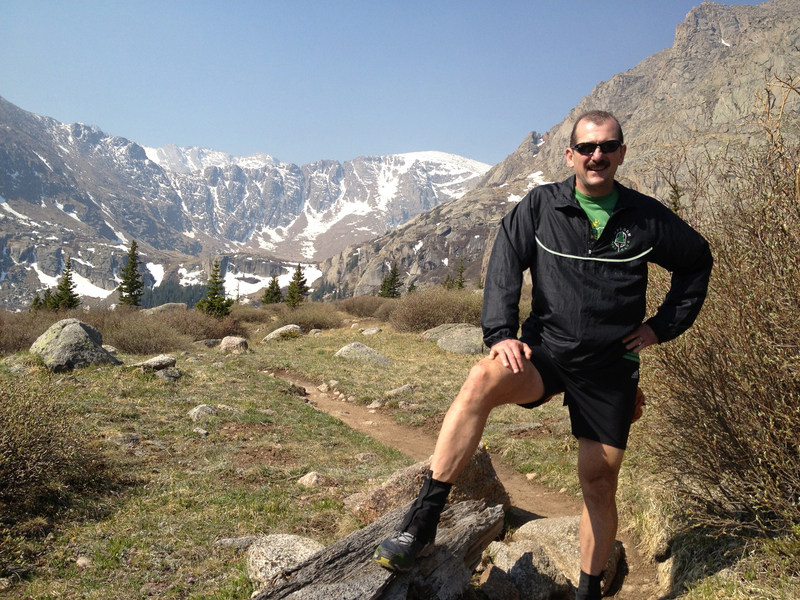 I plan to still run the Bolder Boulder 10K on Monday. We dined at the Echo Lake Lodge that sits at the trail head. This is convenient for sure. I can’t recall anywhere on the Colorado Trail where a cafe was ensconced right at the trail head. The Mt. Princeton Hot Springs and Spa is pretty close to the Chalk Creek Trail Head south of Buena Vista. 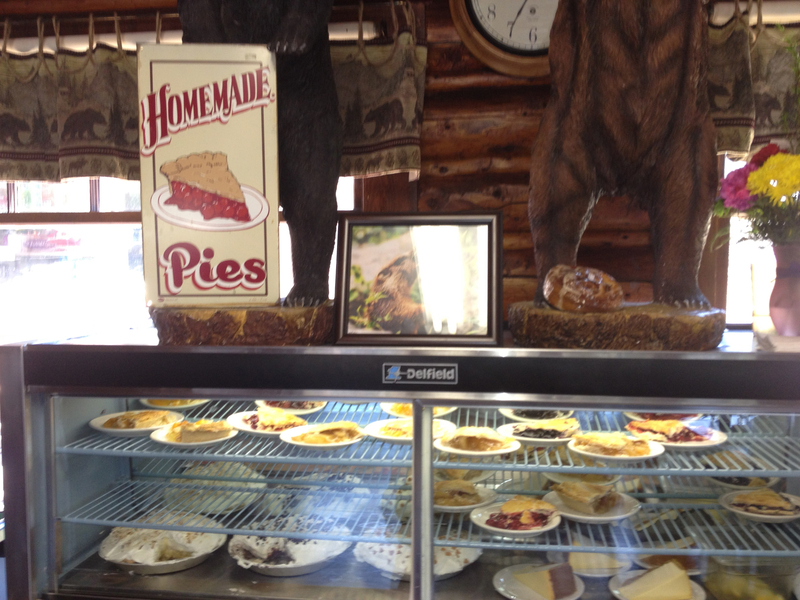 The food at the lodge was fantastic but their specialty is pie. I didn’t finish my entree so that I’d have room for some dessert. Wow! The Echo Lake Lodge is worth a weekend destination drive just for lunch and pie.